All Atlanta area businesses, regardless of their industry, have one need in common: They all need to keep their important documents and files safe and secure. NorthPoint Office Furniture understands these needs and offers only the highest quality filing cabinets to companies in Marietta, Alpharetta, Sandy Springs, and beyond. Sentry Safe – we offer a number of sturdy safes and filing cabinets from this trusted brand, including biometric locking, fire-resistant, water-resistant items. HON – this industry leader offers cabinets in many different sizes from two to five drawers. 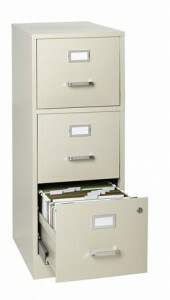 Lorell – this established company has been providing filing cabinets for budget-conscious business owners for many years. Whether you’re a telecommuter in Alpharetta or a businessman in Woodstock, our durable line of filing cabinets can help keep you organized while protecting your important information from spills, theft, and even disasters such as floods and fires. NorthPoint Office Furniture aims to be a one-stop shop for all of your office furnishing needs. That’s why, on top of file cabinets, we also offer desk chair, conference table, reception desk, and computer desk options to help round out your workspace. Contact us today or stop by our 8,000-square-foot Roswell showroom to learn more about your filing cabinet options. While you’re there, talk to one of our sales representatives and have a look around our fully realized display offices for an idea of what your future office could be.